Today Amazon released a press note which said that Amazon’s smartest and the lightest kindle ebook reader till date is the best selling product at Amazon. Sales of Kindle 3 have surpassed Harry Potter and Deathly Hallows book sales at amazon. This is the only product in Amazon’s history ever to achieve such a feat in just five months of its launch. 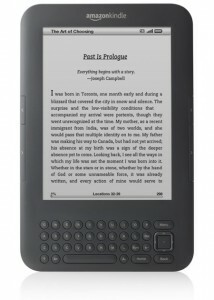 Kindle 3 comes with a improved design and contrast rations. It has twice as much storage space and can store about 3,500 E-books! It weights roughly about 8.7 ounces and also comes with an enhanced PDF reader. Kindle 3 also lets you sync with other kindle-compatible devices and share books! Its screen size measures a 6-inch e-link display, a QWERTY keypad and a 5-way navigation controls. It also has built-in Wi-Fi, web browser, high contrast e-ink display, comes with support for marking annotations, sharing passages and excerpts over facebook and twitter. Did you know it also has Wikipedia access, built-in dictionary, and a battery life of about 1-month with wireless off. That’s simply amazing how well the Kindle manages its battery! Other products at Amazon that had good sales but right behind Kindle 3 included the Apple iPod Touch 8GB, Adobe Photoshop Elements 9, Manga Studio Debut 4, and DVD movies like Inception, The Blind Side and Toy Story 3 among others. Amazon did not mention any sales figures however the holidays did help Amazon get a final push to get its Kindle 3 sales at an all time high!